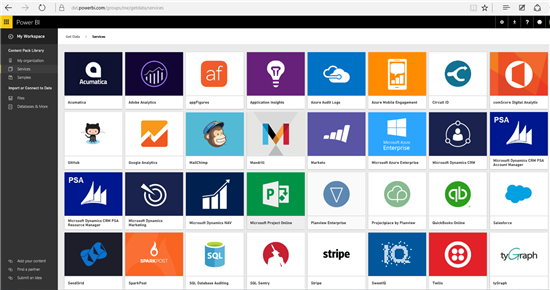 As we approach the end of the year and head into the holidays, we wanted to take a moment to reflect and look back at the work we’ve done on Power BI this year in terms of enabling Developers and our ISV ecosystem of partners. It has certainly been an eventful year, and we would like to thank you for your enthusiasm and support along the way with every release we’ve made to date. When we set out to build the Power BI experience, our goal was to deliver a SaaS led experience for business intelligence, targeting our primary user: the business end user. 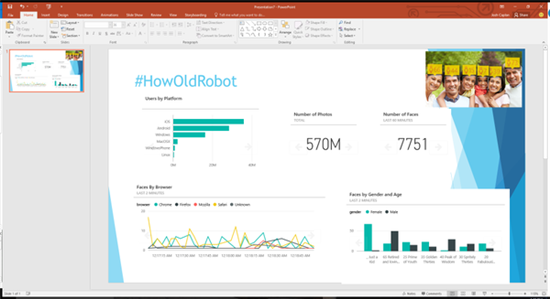 At the time we knew that we had to build a compelling data analyst experience with Power BI Desktop to empower the data analysts to create rich, interesting and meaningful content for end users. There is one other persona we knew without a doubt that we needed to empower: the Developer. The Developer is a critically important person for Power BI, who we think will ultimately bring unique and compelling content into the system for business user consumption. Let’s look at the ways in which Developers can build on top of Power BI. Content Packs are the ultimate enabler of our “5 Minutes to Wow” promise. They enable any business user to get instant out of the box dashboards for some of the most popular SaaS applications, with minimal effort. It’s hard to believe that it’s been less than a year since we launched with just six out of the box Content Packs. In case anyone is keeping track, the first wave included Salesforce, Marketo, Zendesk, GitHub, SendGrid and Dynamics CRM. We have come a long way since then, today we have 36 SaaS Content Packs. And along with our SaaS ISV ecosystem of partners, we have been delivering a new one every single week. Power BI Content Packs cover a broad range of scenarios – including digital measurement, marketing automation, accounting, ERP, email marketing, sales/CRM, project management, cloud communications, developer solutions, and so on. We are seeing an incredibly healthy interest from our SaaS ISV partners and the list of upcoming Content Packs will continue to keep us busy. Over time, we intend to fully open this Developer experience up so that anyone can build Content Packs and submit them to us for publishing to the gallery. While we get that booted up, feel free to work with us directly get your Content Pack into Power BI. For more information on how to build a Content Pack, please drop us a note at pbi_apps@microsoft.com. As we move into next year, you can expect the same cadence from us and our partners on Content Pack delivery. Power BI Developer tools went into preview, as a way to enable Developers to start building custom visuals that deeply integrate with Power BI. We had a fantastic, community supported 4 week long “Power BI Best Visual Contest” which surpassed our wildest dreams by a long shot. As a community, you created and submitted 30 amazing visuals. One for each day of the contest – Amazing! “Export PBIViz” capability in Power BI Developer tools became available to everyone as a way of sharing custom visuals and enabling Developers to build portable, reusable custom visuals to delight their users. Usage of custom visuals became possible in the service and the Power BI Desktop. The reaction and examples are just amazing to look at and play with. Since we launched the visuals gallery back on October 19, it’s grown to include 27 custom visuals. We are working with a number of you that have submitted your visuals to the gallery for every Power BI user to enjoy. With support from the community, we are adding to the gallery every week, with our “Visual Awesomeness Unlocked” series. We encourage you to participate in this awesome community of Power BI visual creators, and show us what your imagination is capable of dreaming up for visualizing data in new and unique ways. We will continue to deliver on the foundation and the momentum we have around custom visuals. Expect to see us support “pinning” of custom visuals this month. Just like content packs, “integration” has been a key Developer scenario of Power BI that we have had from the very beginning. We wanted to ensure that Power BI was a platform, with a modern API that could be used by Developers for extending, integrating and embedding Power BI. While we have lots to do on this front, we have been very pleased and humbled at the same time with the amazing integrations that have been built out by our partners on the API surface we have already delivered so far. While these APIs are simple, don’t underestimate their power! Our partners have done some amazing things with these APIs and have shown that good primitives can go a long way in enabling really compelling scenarios. Let’s look at two specific partner integrations to really bring the power of these APIs to light. We had a guest blog post back in September where Rui Romano from DevScope described their Power BI Tiles add-in for Office, (PowerPoint, Excel and SharePoint). DevScope used the same set of APIs as we have described above, but the experience that DevScope built as an Office add-in is simply incredible. “At DevScope, we have been leveraging the Power BI APIs from the very early days of the Power BI REST API. Power BI REST APIs are simple and easy to use, but also deliver immense power and flexibility to integrate with the Power BI experience, and enabling developers to truly unlock the value in the underlying platform to provide customized integrations and experiences”, said Rui Romano @ DevScope. 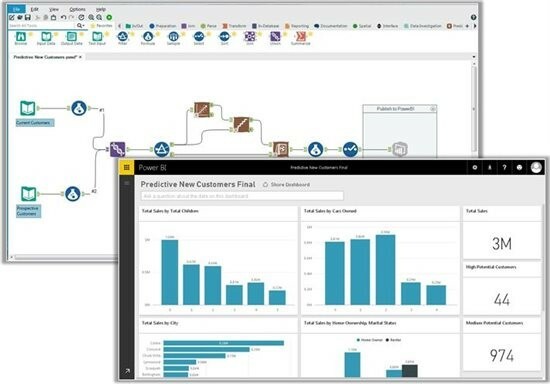 Back in October, we announced a collaboration with Alteryx, Inc. that enabled Power BI as an output destination in Power BI. This integration gives Power BI users the opportunity to prepare and blend data, and then perform advanced analytics such as spatial or predictive in Alteryx, before pushing directly into Power BI for visualization. Next year is going to be another busy year for us. There are some really huge and exciting capabilities that we are working on that you’ll see us make a ton of noise about in early 2016. But as you can see, there’s a lot available with right now for Developers to try. And you can get started by checking us out on http://dev.powerbi.com.